It’s almost essential when visiting Cape Cod to have a tasty seafood dinner. With so many options, it can be almost overwhelming! If you are renting a home, you may consider picking something up from a local fish market and making it yourself either on the stove, in the oven, or on the grill (or you may even bring home your fresh catch of the day and prepare a meal that you caught). Others may opt to dine out at a clam shack, getting fried scallops, fish and chips, lobster rolls, or other staples of summertime. However, if you are looking to get a delicious seafood dinner without getting “the usual”, then consider checking out one of these fabulous restaurants and indulging in their tasty takes on a seafood dinner! 1. The Mews, Provincetown: A year-round favorite, the Mews is known for serving up delicious food and drinks (they have an extensive list of vodkas, great for going and having a few with a friend!). While their whole menu is simply phenomenal, if you are going out to get seafood, try the Local Fish with Tajin and Spinach Salad ($26). The fish varies (it’s the chefs choice) and it is seasoned very nicely with chili and lime, then oven poached with vermouth and served with spinach, red onion, mushrooms, and tomatoes all tossed with a Dijon garlic vinaigrette. 2. Mac’s Shack, Wellfleet: One of three locations (the others being Mac’s on the Pier and Mac’s Provincetown), Mac’s Shack offers up some of the finest seafood on the Outer Cape, with fascinating oyster flutes and sushi being among some of their delicacies. However, if you are looking for a seafood dinner, try the Coco Curry Scallops ($27). The scallops are served with coconut risotto, curry sauce, and cilantro, and although they are out of the ordinary, they certainly taste extraordinary! 3. Mahoney’s Atlantic Bar and Grill, Orleans: Another local favorite, Mahoney’s is known for offering up fine food in a pleasant atmosphere. While all their appetizers and entrees are superb, the Blackened Tuna Sashimi ($25) really stands out. The fresh tuna steak is sliced thin and served up very rare with pickled ginger, wasabi, daikon, and carrots. It is also available as an appetizer ($12.50). 4. The Bramble Inn, Brewster: With a vibrant menu that changes to fit the season, the Bramble Inn always has something unique to offer. For patrons looking to try something a bit out of the ordinary, try the Vietnamese Swai ($26, add ½ a lazy lobster for $10). The Swai consists of a flaky white fish filet, hoisin barbeque glaze, miso broth, bok choy, cellophane noodles, sliced scallion, and shiitake mushrooms. Of course, if you are looking for something without Asian flair, the Bramble Inn still has plenty of fresh, seasonal entrees to offer. 5. The Wild Goose Tavern, Chatham: A family-friendly eatery that offers some mouthwatering food, the Wild Goose Tavern is a great place to stop for dinner while in Chatham. While the whole menu is tempting, their stand-out seafood item has to be the Shrimp and Grits, which consists of tiger shrimp done up with their own blackening spice, sautéed with shallots, garlic, spinach, and white wine, served over Anson Mills organic grits with applewood smoked bacon, roasted tomato, and sharp white cheddar. Definitely not something you’d get anywhere else! 6. Tomatoes Italian Grille, Sandwich: Offering up tasty Italian entrees, Tomatoes also has plenty from the sea ready to serve up to patrons. For a dish that you would be hard-pressed to find elsewhere, try the Blackened Scrod Arancia ($19.99). The scrod is pan-blackened with light Cajun seasoning, then drizzled with an orange butter sauce and served with fresh, creamy herb risotto and pan-roasted asparagus. This is a fabulous restaurant if you are looking to please lovers of Italian food and seafood alike! 7. Bleu, Mashpee: Offering up French cuisine with a twist, Bleu is a magnificent restaurant and well-worth a stop on any trip. If you are looking to try a unique seafood entrée, the Sea Scallops with Maple Grapefruit Glaze ($29) are sure to satisfy your tastebuds. The scallops are served with arugula and sugar snap peas that are tossed in walnut oil, and jasmine rice and a shrimp crispy wrap. 8. Oak and Ember, Mashpee: This restaurant truly has something delicious and amazing for everyone, from steak to seafood to gluten-free entrees that are absolutely mouthwatering. If you are looking to enjoy a seafood dish, try the Summer Halibut ($32, gluten-free). The fish is spiced and pan-seared, then served with a peach chutney, fingerling potato hash, and asparagus. It is the perfect dish for a warm summer evening! 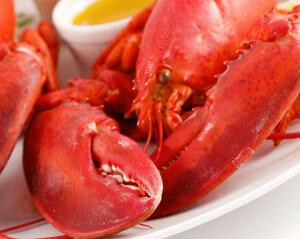 Hopefully this list has tempted you to try out some of the more unique seafood choices at some of the wonderful restaurants located on Cape Cod. Although the basics are nice, breaking from tradition is always a treat!